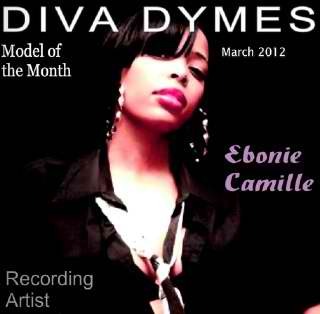 I made the march issue of Diva Dymes magazine. It’s a blessing to be recognized for the work I have been putting in. This will be my second story in a years time. Below you can read my exclusive interview. Diva Dymes:What inspired you to start modeling? Ebonie Camille:The youth of my hometown Joliet inspired me to start modeling. I have always had younger girls that looked up to me. I want to show them to not be afraid to chase your dream. I also want to show them that you can make it without degrading yourself. Diva Dymes:How long have you been modeling? Ebonie Camille:I have been modeling for 11 years. Diva Dymes:How have you been promoting your modeling career? Ebonie Camille:I have been promoting my modeling career on many social sites and event flyers. Diva Dymes:What photographers have you worked with and what photographers would you like to work with? Ebonie Camille:I have worked with the like of Chicago Larry, Gary Beene, Coffe’ Summers, and Mr. Dean. Diva Dymes:What advice can you give young women looking to get into the fashion industry? Ebonie Camille:The best advice I could give is not be afraid to say no. You have a powerful voice always use it to protect your brand. Remember that you don’t have to degrade yourself to make it to the top. Respecting yourself will cause others to respect you. Diva Dymes:What upcoming modeling projects and or events do you have coming up? Ebonie Camille:My newest project is my LadyLike clothing line shoot. I will be shooting with 10 lovely ladies to represent 10 different positive women. My clothing line will be my main fashion source now. Diva Dymes:A lot of times when someone become successful at what they do there are haters trying to hold them back. Have you ran into this situation and how did you handle it? Ebonie Camille:I run across this all the time but it does’t phase me. I know that I’m the only person that can stop me from doing anything. As long as you know you control your business you can never fail unless you give up on yourself. I have believers and non believers and I appreciate them all. Diva Dymes:What is your idea of a romantic evening? Ebonie Camille:My idea of a romantic evening is a nice mellow night. Dinner by candle light and a nice guy with good taste in music would be great. Diva Dymes:Party animal or homebody? Ebonie Camille:I am both. Party animal because I like to show my face and network as much as I can. I am a homebody because I will stay home and computer work for hours and pass up parties. Diva Dymes:Name two of your favorite music artist and two of your favorite songs? Ebonie Camille:Two of my favorite artist are L.E.P Bogus Boys and Kanye West. I play more Chicago music then anything. The two songs are 25 Hour by L.E.P Bogus Boys and Champion by Kanye West. Diva Dymes:Name some of your favorite movies? Ebonie Camille:All my favorite movies are based on entertainment ; The Five Heartbeats, The Temptations, Anne, and Selena. Diva Dymes:If there is a word that could describe your personality what would that word be? Diva Dymes:Where do you see yourself 5 years from now? Ebonie Camille:I will be a mobile with my booming clothing line, talk show, magazine, and top selling record sells. Yes that’s a lot going on but I push myself to the max. You only have one life to live why not give your all.